Host Finland had surprised by even making the final, but they were every bit the Americans’ match, hanging on to force overtime on the back of Noora Raty’s 50 saves. At 11:33 of overtime, Finland’s Petra Nieminen scored what looked like the gold medal-winner. Finland captain Jenni Hiirikoski had made contact with USA goaltender Alex Rigsby before Nieminen scored. The officials on the ice, noting that Rigsby was out of the crease, had ruled that Hiirikoski made incidental contact with the netminder, which is allowed, and even called a tripping penalty on Rigsby. But the video goal judges weren’t so sure. 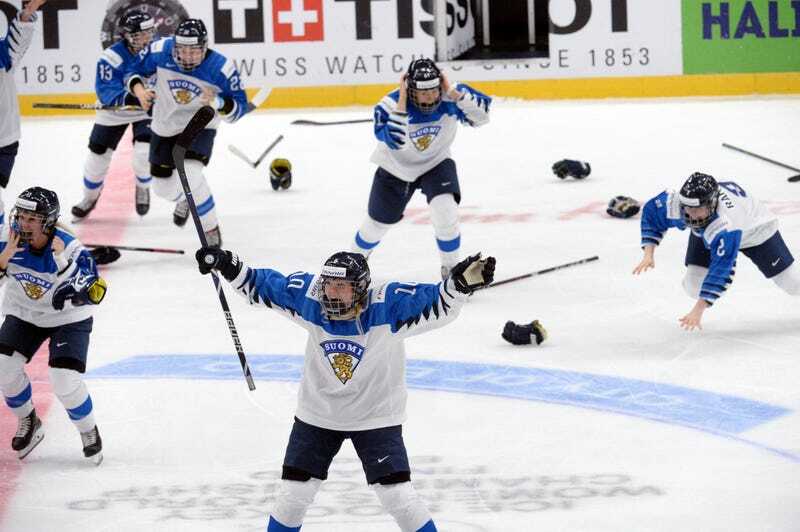 Eventually, after a brutal seven-minute review, the call on the ice was overturned: no goal, and Finland had to pick up all their gear they had cast off in celebration, and had to keep playing. “The referees on the ice had a different view on the situation than the video-goal judge,” Nurminen said. “Referees on the ice were giving a penalty to the goalie for tripping and they were allowing the goal. But when it goes to video review, the power and authority goes the video-goal judges. They saw it as goalie interference and made that decision. Ultimately at issue here is whether Hiirikoski made an effort to avoid contact with Rigsby—and whether she even had the time and space to make such an effort. Well, look at the replays (especially the overhead angle), and you decide. And then decide whether it’s obvious enough to overturn the call on the ice. Team USA would go on to win in a shootout when Rigby stoned Susanna Tapani’s rather unorthodox attempt. Finland attempted to file a formal protest of the outcome, but IIHF rules don’t allow protests of on-ice calls. So it’s over, USA are champs yet again, and Hiirikoski was named tournament MVP, and both feats have just the sourest taste.